Last night I had the opportunity to hear Greg Ip, US Economics Editor of The Economist, speak at the Chicago Council on Global Affairs. He had some great insights on the current state of the US economy and what that might mean for globalization in the coming years. He seems to hold some refreshingly idiosyncratic views of the causes of and lessons learned from the Great Recession, and while I don’t agree with all of his conclusions he was a very articulate and engaging speaker. One issue that I think he and many others unfortunately get wrong revolves around the economic concept of the rational actor. In many people’s telling, neoclassical economics stands or falls on an idea of market participants making completely logical decisions. Since humans clearly aren’t logical, standard neoclassical economics, if not all of economics, must be wrong from the starting gate. Mr. Ip took the recession to demonstrate that actors aren’t rational, and also that the recession itself stemmed from this irrationality. Firstly, in economics, “rational” doesn’t mean the same thing as “logical”. To assume that people act rationally merely means that we can assume that they make choices, based on the information that they have, that increase whatever resource they want to increase. It isn’t a claim that Vulcan-like disinterested logic rules the day, which would be absurd on its face. Unfortunately, the idea of a rational actor tends to be a flimsy straw man that serves no real purpose above a cheap joke against economics. Mr. Ip knows this, and I don’t think it was really the point he was trying to make, but since so many people do try to make this argument, it’s worth stating. What Mr. Ip does miss by blaming the crisis on irrationality is a more profound and perhaps more sobering picture of what we can learn from the recession. I think it is naive to pin the recession on people acting stupidly. It can make you feel good, pointing to the stupid people in hindsight, and feel confident that you would never make what in hindsight turned out to be bad mistakes. Similarly to blaming violent crime on “monsters”, blaming the recession on irrational actors really just serves to create an “other”, where if only it weren’t for that “other” nothing bad would have happened. The crisis, instead, happened despite people acting rationally. It is rational (in an economic sense) for a potential homeowner to purchase a house with no money down if a bank will cover the mortgage. It is rational for a bank to give more and more risky loans if investment banks are willing to get them off their books in return for a nice fee. It is rational for investment banks to be willing to buy more and more risky and complicated assets if they can be pretty sure that they won’t be the ones holding the hot potato when the game is over. And it certainly is rational for investors of all stripes to assume more risk if there is a reasonable expectation that the government will socialize any major losses that occur. The real danger with our current economic system isn’t that it allows irrational people to make bad decisions, it’s that enormous crises can result exactly because it’s in everyone’s interest to keep the party going, enjoy the ride, and allow the taxpayer to clean up afterward. This entry was tagged chicago, debt, globalization, risk, wall street. Bookmark the permalink. Today I headed down to LaSalle St, center of Chicago’s financial activity, to see the OccupyWallSt presence in Chicago and see what I could learn about them. There were probably a hundred people chanting, banging on drums, and holding various signs outside the Chicago Board of Trade and the Federal Reserve Bank of Chicago. A good amount of cars honking in support. I spoke to this family who had come in from an hour and a half out to take part. The mom felt a little bad about taking the son out of school, but she said that since he’s supposed to be learning about democracy anyway, what better place to be than in the thick of things? The son, for one, was loving it (especially the drumming) and wore on his back a sign that read “I’m 10 and will never see Social Security – I am the 99%”. The protesters held a “general assembly” while I was there, giving everyone the opportunity to raise any issue or concern. It was mostly logistics, sharing tactics from OccupyWallSt New York, and morale-raising. Afterward, I spoke to two guys, one of whom more or less led the discussion. They had both been there off and on for a few days and felt like it was their responsibility to be there. I tried to probe and figure out what specifically they were aiming to accomplish and what had brought them down in the first place. I can’t say that I got a firm sense, but they were both very much leftists who were angry with the current situation and institutions in place. They weren’t against the bailout in theory, but how it was used to rescue private interests without nationalizing the banks. They dismissed any substantial overlap with Tea Party anti-establishment sensibilities. The problem seemed not to be power and centralized authority in general; corporate power is overwhelming and government power incorrectly utilized. They certainly seemed sincere. Others I talked to wanted to abolish the Fed, massively overhaul monetary policy, or do away with capitalism in general. One guy really just wanted to complain about City Hall. Overall, I think the day cemented my belief that there are legitimate grievances (it’s hard to be in favor of crony capitalism), but the idea of protesting not for anything in particular seems weak. There has been a lot of varied media attention, most not positive. Are there protests in your city? What are your impressions? There is no right to disrupt traffic or occupy other people’s property, no matter if it’s one lunatic individual or the 99% of the public protesters claim to represent. What’s so lamentable about “Occupy Wall Street” isn’t even their collectivist goals but the means by which they go about to achieve them: force and intimidation. It’s a little unclear whether he’s specifically talking just about NYC, but for the record there was absolutely no “force and intimidation” on display, and I can’t imagine that the half dozen police keeping very close watch would have let any slip by. The protesters went out of their way to insure that a lane for pedestrians remained open at all times. They also were not in the road, so were not disrupting traffic, and were on no property but the public sidewalk. The only moment I witnessed over a couple hours that could have led to a heated exchanged was when a businessman walked through the protesters’ general assembly meeting and called out “profit is healthy!”. I may agree with him, but if there were a moment for “force and intimidation”, that would have been it. Needless to say, nothing happened. By the way, if you want to buy Nazi coins, you can do so on Hoenig’s site. This entry was tagged protests, wall street. Bookmark the permalink. Main Street Venting Blues deals with many of these issues. In our interview with The Story, we were asked about this song as a modern-day protest song. The comparison makes sense, but the big difference that I see between social anger during the Vietnam War and today is that back then there was a clear goal: ending the Vietnam War. Today, what is the unifying goal? Is there one? 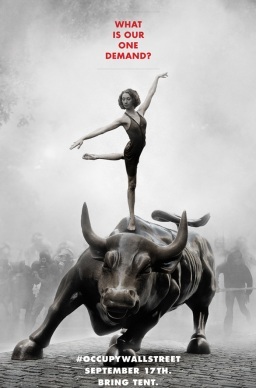 This memorable poster for the Occupy Wall Street event is clear in stating that there is no single unifying demand or movement behind the protests. If they were primarily concerned with changing the legal structure or opposing the bailouts, it would make more sense to be protesting the White House, Congress, or even the Federal Reserve. These organizations make the rules and decide where to allocate bailout and stimulus funds. For decision-making, the buck stops there. Perhaps the protesters themselves are unsure as to what precisely they are protesting. That there is a general sense of anger is indisputable and understandable. But when dealing with such a complex crisis as the Great Recession, actor identity and motivation are hard to parse. Is anyone on the ground in NYC that wants to share what they see?